While home birth in countries like Canada or Netherlands is a reasonably safe option, it is not the case here in the USA. Not a single peer review study regarding home birth in the USA supports that idea that "home birth is as safe as hospital birth" -- they each, in fact, show an increased risk for babies born at home versus in a hospital. (Even the 2014 MANA study and the 2005 BMJ study show an increased risk to babies born at home). We, unfortunately, stand alone in our home birth practices in the USA -- which is why all studies point toward a higher risk at home versus hospital. Medical malpractice insurance is important for your care giver to have. If your care provider is working in a hospital, they are carrying medical malpractice insurance. If they attend births only at home or in freestanding birth centers, then they likely do not have malpractice insurance. They may have insurance to cover their business, but it likely is not medical malpractice insurance. First is birth injury. If you or your child experience injury during childbirth (physical injury like brachial plexus injury or neurological injury like cerebral palsy), that’s when a lawsuit can mean the difference between you having the compensation you deserve versus struggling for the rest of your life paying for your child’s medical bills, physical therapy or other special accommodations or equipment she or he may need. The second thing to consider the study by Lana Muniz, PhD that shows in states where medical malpractice insurance is required for home birth, their mortality rates are cut in half. Hospitals also have review boards to deal with complaints and to make sure they are doing their jobs as best they can. A Certified Nurse-Midwife friend of mine had this to add, “Our hospital holds a monthly Perinatal Morbidity & Mortality review meeting. Obstetricians (attending & resident physicians), CNMs, maternal-fetal medicine physicians, neonatologists, nurses, pathologists and medical students all attend. We sit in an auditorium while physicians present cases in which there were low APGAR scores, severe illness (e.g., severe preeclampsia), death of mother or baby. The various physicians involved in care present relevant data from research. We discuss how to do a better job in the next such case, how to advise these woman about their next pregnancy and any other issues that arise. If someone takes on the incredible responsibility of caring for mothers and babies, there should always be a system that allows for such peer review & learning opportunities. To do so otherwise is grossly irresponsible." There is a huge difference in what you will find at a home birth versus a hospital birth as far as emergency equipment goes. It's one thing to hear your midwife say "here's what I will bring -- it's everything you need in an emergency," but it's another to actually see the difference in equipment at homebirth and hospital birth. Perhaps the biggest difference is the team you will find at a hospital that you won't have at home - especially if your midwife works alone. A nurse-midwife student had this to say: "Not only is there a team full of certified, competent people, but in a hospital, they are running dystocia drills or practicing for other obstetric emergencies. These are people who have practiced working together, who have assigned roles, and in addition to all the drills, have seen their share of real emergencies. They not only have a pediatric and adult code teams, but depending on size and type of hospital, they may also have OB rapid response and code teams as well,as they do in my hospital. It's a well oiled machine." There are circumstances when minutes can really be the difference in life or death. The reality is, if an emergency arises and what your midwife tries doesn't work, you will be transferring to a hospital... losing precious minutes. In the USA, anything goes for home births. There are no guidelines or practice bulletins. There are no formal education requirements. It doesn’t matter how high risk a mother might be, she’ll likely be able to find a home birth midwife who will not only take her on but will convince her that home is the safest place to have her baby. Home birth also doesn’t mean evidence based care, as one might think it does. From lack of monitoring during labor to inducing with herbs to treating GBS with garlic and/or Hibiclens to VBACs without continuous EFM to breech and twins delivered outside of a hospital, there is a long list of common home birth practices that are not supported by any evidence at all. What??! Experience is on the list?? Yes… Yes, for me it is. 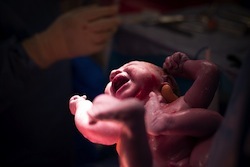 I’ve seen beautiful, empowering births in all settings (home, birth center, hospital)…. It doesn’t have to be home for it to be like that. Having a peaceful, calm, intimate experience is no doubt appealing and yes, it may be more likely to happen at home. But let’s be real here… birth is also super messy. I’ve seen mattresses ruined and carpets left with blood stains at home births. I’ve seen mothers getting out of tubs, freezing cold, to lay down on the floor to have their midwives check on bleeding and/or to do stiches. These are things that are often left out of the story when the home birth story is shared online or retold in person. I had one home birth client have a really bad experience during the immediate postpartum period of her home birth. It was devastating and something that really took an emotional toll on her… And yet, on Facebook she called it a “perfect experience.” Another example is this article shared on Pop Sugar to show how beautiful and amazing this mother’s home birth experience was… except for the fact that the home birth was actually a nightmare experience and both the baby and the mother almost died. You can read the real story of what happened from the mother’s account of what really went down. I realized what you see about home birth - and how it is glamorized or romanticized - isn't always what you get. In a hospital, while you lay in bed holding your baby, they take care of it all. That pretty much sums it up for me. What about you? Why did you choose hospital birth?